Please note: These custom jigs are hand tied and made individually for each order. Please allow extra delivery time. Colors may vary. A minimum order of 3 for each color combination is required. The orignal Flair Hawk is a go-to bait for anglers who fish Florida’s bridges and spillways for snook. The flared nylon hair puffs when pulled through the water, grabbing the attention of those beautiful silver fish with the distinctive lateral line. 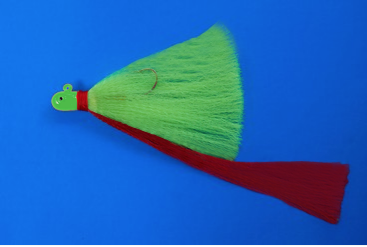 Any snook-a-haulic worth his or her salt will swear by the original Flair Hawk and its sister jig, the Skimmer Flair Hawk. Weight 1 oz 1-1/2 oz. 2 oz. Orders are shipped Monday through Thursday, excluding holidays. * Please allow 3 extra days for The Build Your Own jigs, as they are custom made with each order.